Weather was good this past week for Icemaking in front of Trapper’s Landing Lodge. We have ice depths ranging from 14″-16″ out to Huddle’s Reef, over to Diamond Point and Roger’s Point. The ice is doing great except for one large pressure ridge that formed from Rogers Point heading NW towards Ottertail Point. This is an active pressure ridge and there is no traffic advised past this crack, you will not be able to reach a big rock reef or horseshoe bay reef due to this crack. We will be open this weekend to ½ ton trucks with single axle wheel house traffic. You will be able to head out to Huddle’s Reef and the Diamond Point area. If you are wanting to travel past those areas, ATV/Snowmobile traffic is advised. Fishing pressure has remained low this past week. The few anglers we have had out have been finding their fish during the lowlight periods and overnight periods in 15-20 ft of water, on Huddle’s Reef and the Diamond Point area. Bring a camera with to scout for your spots as most of the fish are on the sand/rock transition zones. Most anglers are using a spoon tipped with a minnow head to catch their fish while the guys staying the night are having walleye hit on their setlines. Perch Fishing on the lake has been steady with most of the fish coming in the remaining weed lines in Miller Bay and Boy Bay. Small jigging spoons tipped with a full crappie minnow or euro larvae are catching the most fish. Make sure you pack the underwater camera to find the edges of the weeds and remaining weed lines. Panfishing has been good on the smaller local lakes in the areas as most of the fish have moved their way out to the deep basins of the lakes. Keep moving in these areas until you find the fish and then use your favorite tungsten jig and plastic combo, red has been the hotter color on most of those smaller lakes. We have plenty of ice in the area currently and many of the smaller lakes have been good for travel too, with little pressure. The Merit will be open this weekend Thursday – Saturday with some great specials and for the times when the restaurant is not open, we will have Heggies Pizza and drinks available at our Front Desk. 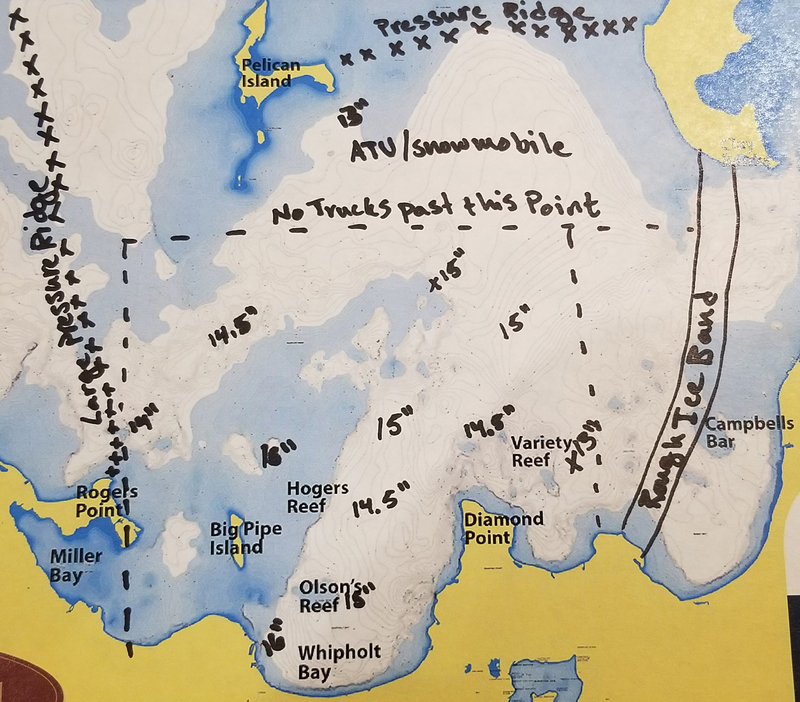 As always feel free to call us for a more up-to-date report and make sure you stop by the Lodge for your complimentary Ice and Fishing map. We hope to see you on the ice. Call 218-836-2500 for lodging availability & reservations.